Hello, all! It’s already time to wrap up week 3 of Me Made May 2014. We’ve been having a particularly hectic at the moment because my daughter’s childminder is very sick and has been off work since last Tuesday, and we just learned she would get back on June 2 in the best case scenario. I am very worried for her, and we have been completely scrambling for the past 10 days. Getting emergency childcare has proven very challenging and as we have no relatives nearby, and this is one of the very busiest months on the year for both of us, it’s been extremely stressful. We miraculously got a spot at a local childcare (that she’s been to in the past) for this morning and tomorrow morning, but no idea yet how next week will be. I’m typically getting up at 4 am and going to bed at 11 pm to make sure I stay *almost* on top of things. All that being said – I am very happy to say that I have been steadily keeping up with MMMay, and have even managed to snap a picture almost every day (which wasn’t actually part of my challenge). Last Monday was an absolute no-go, as I was away all day and only came home from work at 9 pm! I wpre my Rowan crochet top that I also wore on May 11 last week, along with the handmade trousers I wore on May 14, so you’re not really missing out on anything. May 15: L’été Enfui blouse – Burda World of Fashion June 2008 (Burda Tendances Modes juin 2008) – Blouse 107 . Made in 2008. May 16: Another New Look 6557 (same as my Olivia Dress last week), in a light blue floral print on a white background. Made in 2006. 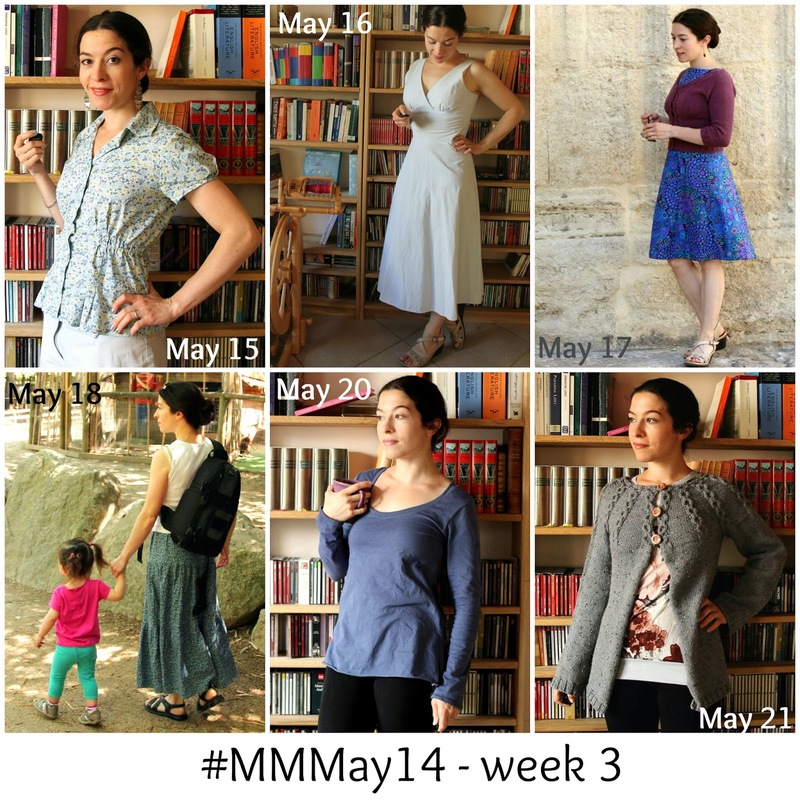 May 17: Blue Anna and Miette cardigan (never blogged!). Both out of Rowan fabric and yarn! I was complimented in the street that day for my outfit. Made my day. May 18: Ruffled skirt (link with take you to tutorial). It was very summery on Sunday and we went to a petting zoo and had lots of fun. May 19: Not photographed – Amsterdam Top from Rowan Summer Crochet and New Look trousers. May 20: Deer and Doe Plantain wearable muslin (finished last weekend) for a quiet day of working from home (and taking care of my daughter). May 21: Day Tripper Top (also shown in Week 1 of MMMay) and Honey Cardigan, which I finished the night before! Perfect for the rainy, stormy weather and for working from home again. Design is by Veera Välimäki. I absolutely adore the items (especially Blue Anna) you have made recently! Just beautiful! Hoping your child care sorts itself out for next week and your minder is well and healthy soon! You're stunning in the white dress!